Play all Markos quests to unlock another trophy in Assassin’s Creed Odyssey! We’ll show you where it starts! Find Legendary NPCs in Assassin’s Creed Odyssey, we’ll show you how the trophy works! All Xbox One Achievements to Valkyria Chronicles 4! We have all the achievements and their conditions! I Have The Power – Assassin’s Creed Odyssey Trophies and Achievements Guide! We show you all weapon types! Find all the collectibles in all episodes of Life is Strange 2. We have all the locations, all the trophies and achievements! Find a total of 20 small pets to unlock the Zoologist Trophy in Shadow of the Tomb Raider. We have all the locations for you. All Xbox One Achievements to League of Evil! We have all the achievements and their conditions! Shadow of the Tomb Raider, Amulet of the Savior. We show you the entrance to the cave and where the silver chain is hidden! Unlock the Rambo Trophy in SOTTR! We’ll explain how this task works! We show you the complete list of all xbox one achievements to the game fossil hunter. All tasks and tips! We’ll tell you all about the Tomb Raider Trophy / Success Chain Gang! What skills you need and what you need to do. Find all hidden Conquistador treasure chests. 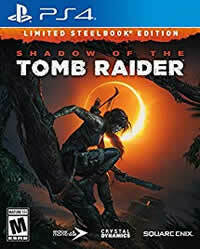 100% Shadow of the Tomb Raider. Several headshots in a few seconds? We’ll explain how you can unlock the Trophy Gunslinger in Shadow of the Tomb Raider. Find and solve all challenges in Shadow of the Tomb Raider! We have all localities and solutions!